More than a decade after the Costa Rican government vowed to compensate thousands of banana workers exposed to a deadly pesticide, many said they still haven’t received what is owed to them. Banana workers gathered Wednesday outside Costa Rica’s Legislative Assembly in San Jose to demand compensation after being exposed to the pesticide that causes health problems including sterility, cancer, miscarriages and genetic deformities. 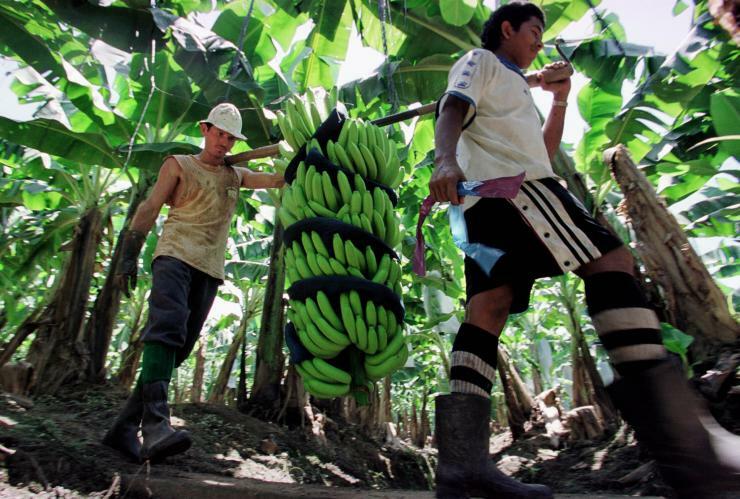 The workers allege that foreign companies operating banana companies in Cosa Roca exposed them to the nematocide Nemagon, also known as DBCP. Protesters want ₡5 million ($9,400) each, as well as a monthly pension of ₡300,000 ($565). Costa Rican lawmakers in 2001 promised to compensate former banana workers exposed to the pesticide, but many still haven’t received any money. During the protest, the demonstrators held signs, including one that read: “We want a pension and fair compensation.” “It looks like they are waiting for us to die,” José Carlos Madriz, a banana worker from Batán, told Tico Times. He was employed from 1967 to 1973 with the Standard Fruit Company. In 2014, Costa Rican lawmakers again promised to pay about 12,000 banana workers who had been exposed to pesticides in the 1960s and ’70s. Costa Rica’s Supreme Court has ordered the government to pay the workers. In all, more than 13,000 victims have received CRC 14 billion (U.S. $25.86 million) from The National Insurance Institute (INS), La Nacion reported. Costa Rica’s government has been struggling in recent months to revive its $50 billion economy and close its fiscal deficit. President Luis Guillermo Solis took office last year, vowing to turn around the economy, according to Bloomberg. The left-wing leader promised to tackle corruption and poverty during his campaign, according to the BBC. “There is unquestionable demand for change, for things not to carry on as they have, and I aim, with the help of God and the support of all of you, to bring you those changes that you’re clamoring for,” he said after his victory. This article originally appeared on International Business Times.